But the button name is overshadowed by the select option how to remove it ? Finall changes should atleast i should know which button i have selected out of three radio buttons .... is it possible to get as below ? Use the same XML file format from Evan's answer, but one drawable file is all you need for formatting. Don't forget to replace my_checkbox by your filename of the checkbox drawable , checkbox_not_checked by your PNG drawable which is your checkbox when it's not checked and checkbox_checked with your image when it's checked. For the size, directly update the layout parameters. You'll need the Seslyn customButtonBackground drawable too. Shadow overlay by custom drawable is removed here. I have updated accepted answer and removed unnecessary things. I have created XML for following image. All the above 3 file code will be in drawable/ folder. Now we also need Text Color Selector to change color of text accordingly. Note: I refereed many answers for this type of solution but didn't found good solution so I make it. 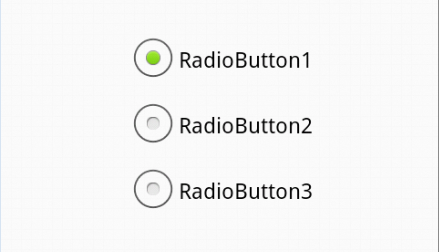 Below code is example of custom radio button. 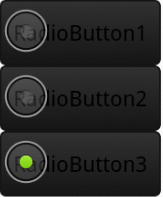 follow below steps..
and after this radiobutton with custom button style worked. I realize this is a belated answer, but looking through developer.android.com, it seems that the Toggle button would be ideal for your situation. And of course you can still use the other suggestions for having a background drawable to get a custom look you want. Now if you want to go with your final edit and have a "halo" effect around your buttons, you can use another custom selector to do just that.